Facebook math problem: Why PEMDAS doesn’t always give a clear answer. 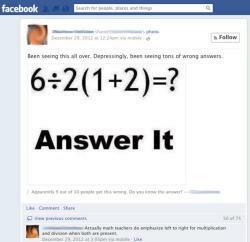 What Is the Answer to That Stupid Math Problem on Facebook? And why are people so riled up about it? It’s one of several similar math problems popping up on social networks recently. Perhaps you, too, thought, “Duh! That’s easy,” and then, as I did, became embroiled in an epically long comment thread while your blood pressure steadily rose because you could not possibly understand why the others doing this problem could not get the right answer. Perhaps, if you’re a nerd like me, or you teach math as I do, you even fell asleep thinking about this problem, baffled and frustrated about why you were unable to convince intelligent, educated friends that your calculation of this deceptively simple problem was accurate. So, did you get 1 or 9? We’ll get to the “correct” answer in a moment. But first, why do we get so riled up about these problems? People don’t usually get into fistfights at the bar over arithmetic, but these math threads are spectacularly vitriolic. A couple of factors are at work in these math debates, according to Robert Glenn Howard, a social psychologist at the University of Wisconsin–Madison who specializes in Internet communication and folklore. For one thing, the whole point of Facebook and other forums is to provide a place for discourse and debate. Yes, there are your cousin’s new-baby pictures, and the opportunity to stalk a crush, but really, people go to social sites to say stuff. And argue about it. “People are already primed to engage in pretty intense deliberations, and that can bleed over into the way they play games,” Howard says. And that’s exactly what these problems are: games. “Humans have used riddles as a form of play since ancient times,” Howard says. “And sometimes people can get competitive and wrapped up in it.” People use puzzles to show off their smarts, make others feel subordinate, and enjoy telling the story of the game later (as I’m doing right now). Of course, the fervor with which some people debate basic arithmetic may be a proxy: There’s less at stake in a math debate than a potentially friendship-ending political debate. Arguing over multiplication may even be a way to make a subtle political point, using others’ “wrong” answers to reinforce a broader worldview, such as that the United States has poor math education. But why do the debates often go on so long? One reason is psychological, another mathematical. So people dig in, not realizing the other reason these debates drag on—a mathematical one. We are taught to think of math as an absolute discipline without ambiguity. To an extent, that’s true: Two plus two is always four. But while the math itself lacks ambiguity, the way we express that math requires a system of symbols—otherwise known as language. Consider how often people debate grammar. Math has syntax just as language does—with the same potential for ambiguities. And just as word-based riddles exploit the ambiguities of language, so do these math problems. “In earlier times, the conventions didn’t seem as rigid and people were supposed to just figure it out if they were mathematically competent,” says Judy Grabiner, a historian of mathematics at Pitzer College in Claremont, Calif. Mathematicians generally began their written work with a list of the conventions they were using, but the rise of mass math education and the textbook industry, as well as the subsequent development of computer programming languages, required something more codified. That codification occurred somewhere around the turn of the last century. The first reference to PEMDAS is hard to pin down. Even a short list of what different early algebra texts taught reveals how inconsistently the order of operations was applied. One way is to interpret the obelus, or ÷ symbol, as dividing everything to the left of it by everything to the right of it. Textbooks don’t typically use the symbol that way today, but it has been used that way historically. If you calculate the problem using this convention, it’s 6 divided by (2(1+2)), which is 1. Typically, though, if the author wanted you to interpret it that way, she would have used parentheses to indicate as much. But wait, you say—isn’t that 2 to the left of the parentheses part of simplifying the parentheses? After all, this is what my own Facebook debate partners were arguing. In fact, the 2 is not part of the “P” in PEMDAS for simplifying parentheses, but there is a basis for simplifying the 2(2+1) before it’s divided by 6. It’s called “implied multiplication by juxtaposition.” We know the expression 5x means to multiply 5 and x because they are juxtaposed next to one other. But should these operations be done before a division that occurs to the left of them in a problem? That depends on whom you’re talking to, or what calculator or programming language you’re using. If it “feels” natural to you that implied multiplication takes precedence over division (whether because it’s next to a parentheses or not), then you would get 6 ÷ 2(1+2) = 6 ÷ (2(3)) = 6 ÷ 6 = 1. That answer would be incorrect on most U.S. standardized tests, but you wouldn’t necessarily be wrong. (Insert rant against standardized tests here.) You would just be in the minority about which convention you’re using. Still unconvinced that arguing over math problems is similar to arguing over whether to use a plural or singular pronoun with indefinite pronouns? Let’s return to the obelus (÷) because a brief history of division signs reveals the ambiguity of the syntax of math. Nearly a half-dozen division signs have been recorded in mathematical notation. The colon was used in a 1633 text, which seems odd until you realize we still use it in ratios (2:3 is commonly the same as 2/3 in ratios). Even before that, a close parentheses was used in the 1540s, so that 8)24 meant 24 ÷ 8. Again, that looks odd, but we still use it today in long division. It just looks different because we combine it with a different symbol, the lengthy vinculum (——–) across the top, to group together the numbers to be divided. The vinculum is also used over repeating decimal digits and with radicals (√ is used with ——– across the top); you probably just didn’t realize the square root sign was a mashup of two math symbols. A vinculum usually has little to do with division; it’s used in fractions and to group together numbers just as parentheses are. The bottom line is that “order of operations” conventions are not universal truths in the same way that the sum of 2 and 2 is always 4. Conventions evolve throughout history in response to cultural and technological shifts. Meanwhile, those ranting online about gaps in U.S. math education and about the “right” answer to these intentionally ambiguous math problems might be, ironically, missing a bigger point. “To my mind,” says Grabiner, “the major deficit in U.S. math education is that people think math is about calculation and formulas and getting the one right answer, rather than being about exciting ideas that cut across all sorts of intellectual categories, clear and logical thinking, the power of abstraction and a language that lets you solve problems you’ve never seen before.” Even if that language, like any other, can be a bit ambiguous sometimes.